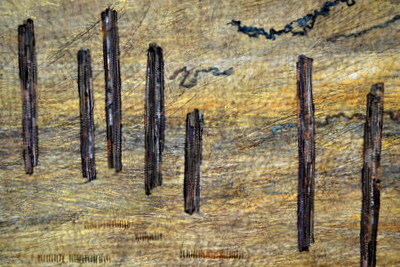 The third (and last) in the series of quilts inspired by rows of old groynes on south coast beaches. 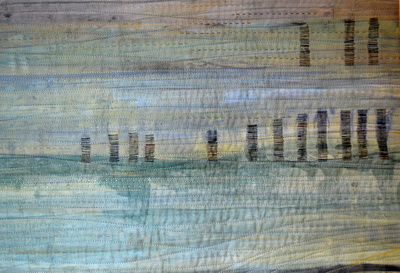 Made for Contemporary Quilt's Horizons exhibition which debuted at the Festival of Quilts in 2013. Materials: Hand dyed cotton sateen Hand dyed and commercial threads. Method: Wholecloth with a small amount of raw edge appliqué. Fabric coloured by several processes including scraping with thickened procion dye, thermofax printing and monoprinting with discharge paste and dye to create depth. Texture is added with dense hand and machine quilting. Copyright © Terry Donaldson 2013. All rights reserved.